News and notes from the world of ACC Football heading into Week 6 of the 2017 season. A battle of Top 25 squads kicks off week six of the ACC schedule when No. 17/17 Louisville travels to No. 24/24 NC State on Thursday, Oct. 5. The game will be televised by ESPN at 8 p.m.from Carter-Finley Stadium in Raleigh. This is the first time the two teams have met in an ESPN Thursday night game. NC State is ranked No. 24 in both the Associated Press and Amway Coaches Top 25 Polls. This marks the first Top 25 ranking for NC State since the final poll of the 2010 season when the Wolfpack was No. 25. Louisville’s Lamar Jackson has 37 career rushing touchdowns and is just one shy of the ACC career mark for a quarterback (38) set by Georgia Tech’s Tevin Washington (2009-12). Jackson needs only 13 yards to have 10,000 career total offense yards. 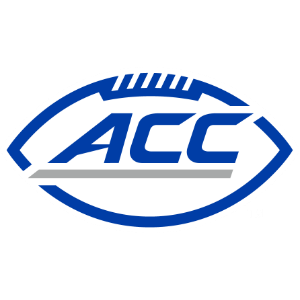 Five ACC teams are ranked in both the AP and Amway Coaches Top 25 Polls this week. No. 2/2 Clemson leads the way, followed by No. 13/12 Miami, No. 16/19 Virginia Tech, No. 17/17 Louissville and No. 24/24 NC State. Florida State leads all others receiving votes and Georgia Tech is also receiving votes. Coastal Division rivals Virginia and Duke will meet for the 68th time this Saturday in a series which began in 1890 in Richmond, Virginia. UVA holds a slim, 35-33 advantage, and has won the last two meetings. Under David Cutcliffe, Duke has taken six of the last nine contests. Clemson’s win over 12th-ranked Virginia Tech last week marked the first time in ACC and AP poll history that a team has recorded three wins over Top 15 teams in the month of September. The Tigers downed No. 13 Auburn on Sept. 9, No. 14 Louisville on Sept. 16 and No. 12 Virginia Tech on Sept. 30. The combined score of those three games was 92-44. Wake Forest travels to No. 2/2 Clemson on Saturday for a noon kickoff on ESPN2. Tigers’ head coach Dabo Swinney has never lost to the Demon Deacons. Miami holds a one-game advantage (31-30) in the series with Florida State, which resumes this weekend in Tallahassee at 3:30 p.m on ESPN. The Seminoles have won all seven meetings with Jimbo Fisher as head coach. Ironically, FSU leads in games played in Miami (20-17) but Miami leads 14-10 in games played in Tallahassee. Pitt travels to Syracuse on Saturday for a rematch of last November’s high-scoring affair. Pitt’s 76-61 win was the highest-scoring regular season game in FBS history with more than 1,300 yards of combined total offense (668 for Syracuse and 644 for Pitt). The two teams set an FBS record for most combined points (137) in a single regulation game and most combined touchdowns (20). North Carolina plays host to No. 21/22 Notre Dame at 3:30 p.m. on ABC. The Fighting Irish have won 17 of the previous 19 meetings, including a high-scoring 50-43 decision at South Bend in 2014. For the first time since 2014, Boston College plays under the lights in a Saturday primetime home game as the Eagles host No. 16 Virginia Tech on Saturday. The Eagles rushed for a season-high 224 yards in a win last week over Central Michigan. Eight ACC football players have been named semifinalists for the National Football Foundation’s Campbell Trophy, which is given annually to the nation’s top football scholar-athlete. The semifinalists are OT Gabe Brandner of Duke; OT Andrew Marshall of Georgia Tech; WR Braxton Berrios of Miami; TE Cole Cook of NC State; P Ryan Winslow of Pitt; DB Jordan Martin of Syracuse; LB Micah Kiser of Virginia and TE Cam Serigne of Wake Forest. ABC’s Saturday Night Football featuring Clemson at Virginia Tech on Sept. 30 at 8 p.m. earned a 3.0 overnight, the best among all networks in week five.